Some heroes are covered in fur and walking on four legs. Nikon was one such hero. 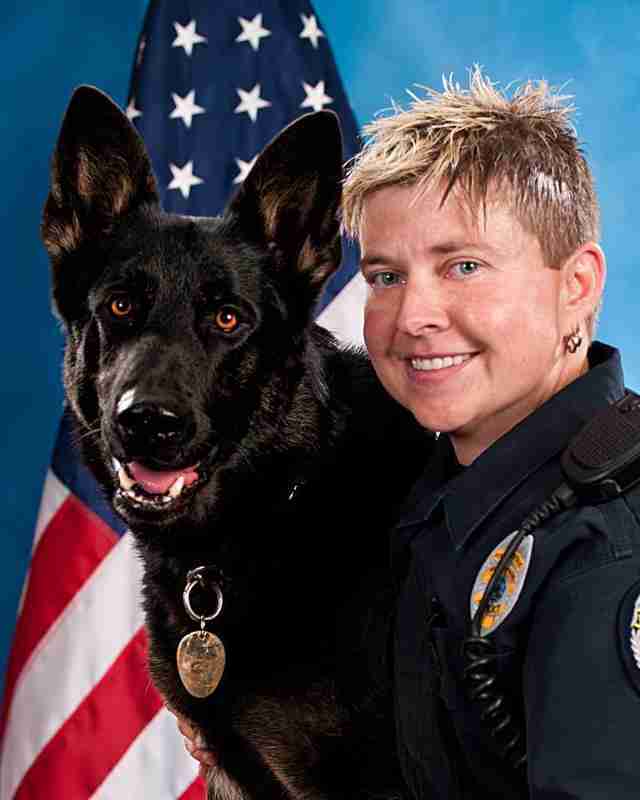 He was a K9 police dog who with his handler, Officer Karen Simmons, worked for the Winston-Salem Police Department in North Carolina. Karen's wife, Keely Greene, was given the honor of naming him and based on her first meeting with him, she knew he was destined for victory. So she named him Nikon, the Greek word for "victory." At home, Nikon was just one of the dogs. 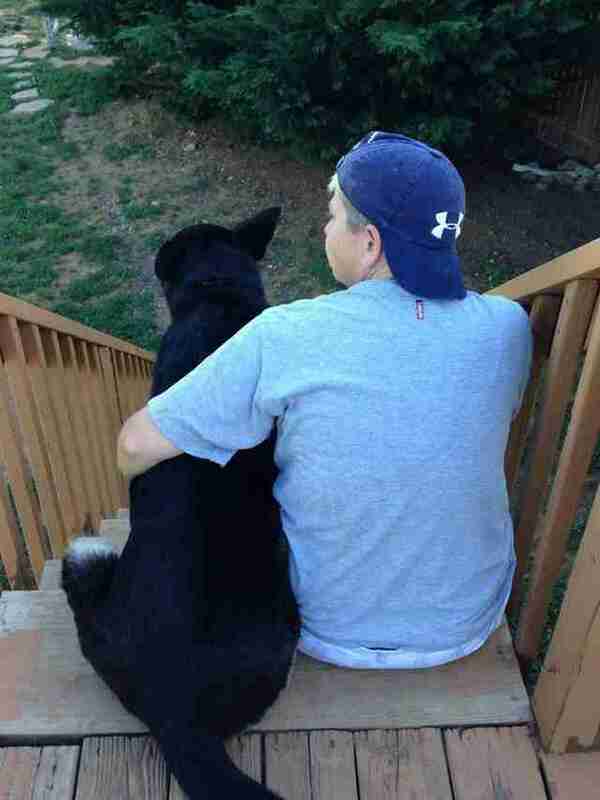 He had a special bond with one of their dogs. Otis had been found chained to a vacant house. He was still suffering the negative effects of his former life when he joined the Simmons-Greene family. Nikon seemed to have intuition to Otis' needs and was right there with Otis as he learned to walk and run again. They slept side by side every night. Nikon was as much a part of the family as he was Karen's co-worker. 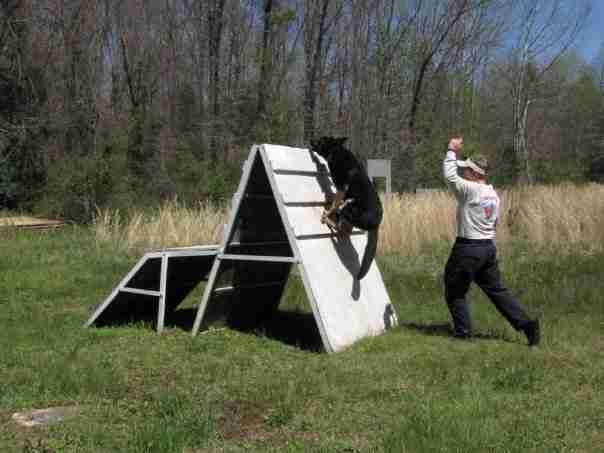 Nikon completed his training and hit the streets in 2008 with Karen. He wasted no time in showing his crime fighting skills. 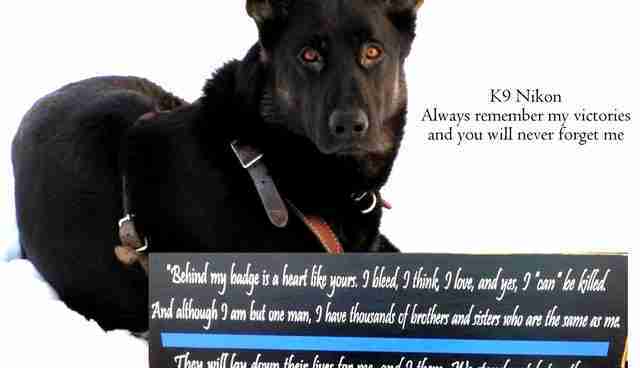 He was as loyal as a partner should be. His was a lucrative career. He was instrumental in the apprehension of such tough suspects that many are likely to still be bearing the outline of his bite marks on their bodies. "Nikon also helped find $32,000 worth of evidence and property in addition to about $300,000 in illegal narcotics. Nikon is credited with getting $160,000 in money seizures to illegal narcotics. The K-9 also helped find 37 firearms. Nikon also helped find 312 people." Nikon was honored for finding an alleged murderer, saving the life of an elderly man and finding a suicidal girl in the woods. 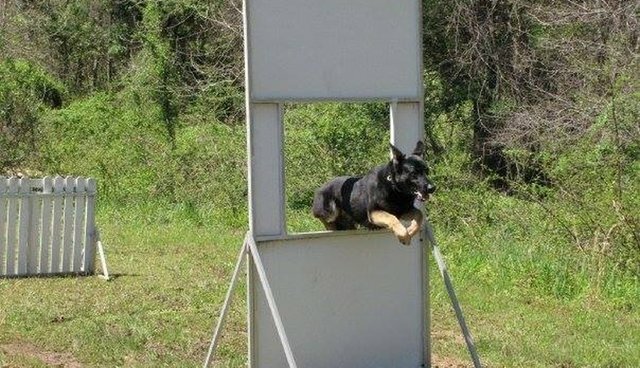 We humans rarely see work as enjoyable as police dogs. They look forward to the "game" of finding the clues that solve crimes. During all of these operations, Karen had his back and he had hers. The families of law enforcement officers are unsung heroes, too. Keely often worried about Karen's safety on the streets but she knew Nikon was there to loyally protect her every day. 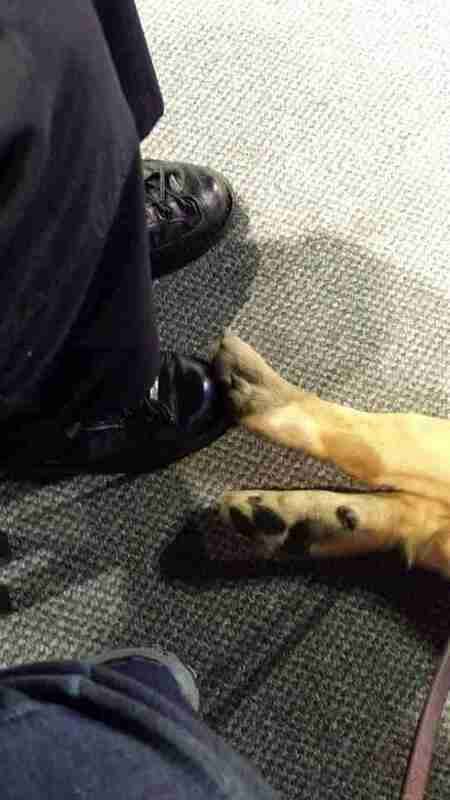 The mutual devotion was evident. Keely states, "he took every breath for Karen." Nikon retired with honors at the end of June. 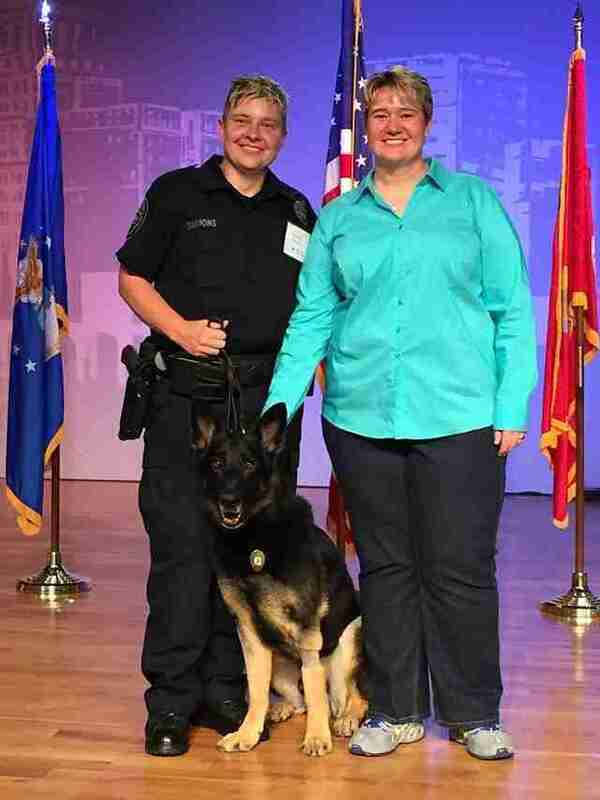 Karen and Keely were looking forward to sharing the rest of Nikon's life with him as a civilian. 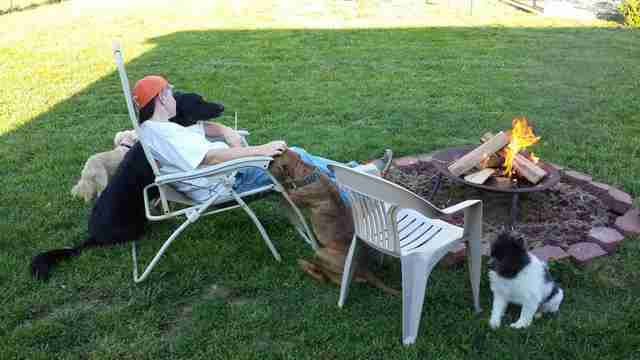 Lazy days and relaxation was what he deserved and they were going to see that he enjoyed every moment. On the morning of July 28, just barely a month into retirement, he started throwing up. X-rays revealed an object in his stomach and the hope was that it would move down naturally. The following morning he became lethargic and another x-ray revealed a hernia and a lot of fluid. The veterinarian performed emergency surgery and it seemed a success when Nikon's heart stopped. Despite thirty minutes of valiant efforts by the veterinary medical team, Nikon didn't make it. For Karen, the world stopped and Keely, herself devastated, could not console her. Tears flowed, shamelessly, from everyone. Nikon was gone. Keely never stopped admiring how Karen and Nikon worked together, so bonded, but her favorite memory is when a little girl named Ellie befriended Nikon. There was an instantaneous connection between this small human and mighty dog. Shortly after Ellie's family moved two hours away Keely and Karen received a call from her mother. Ellie was having nightmares that a bad person was breaking into their house because she no longer had Nikon nearby to protect her. 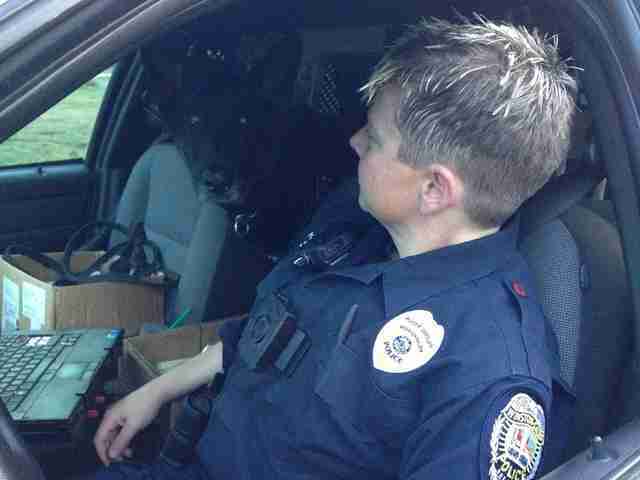 Keely sent Ellie a stuffed police shepherd with a letter signed by Nikon's actual paw print. The box got lost in transit and no one could find it. When Keely called Ellie's mom to tell her about Nikon, she confirmed the box still hadn't arrived. Ten minutes after they hung up, a photo of Ellie holding the stuffed animal and note popped up on Keely's Facebook page. The package had finally arrived. Nikon remains victorious, even from Dog Heaven. Nikon's ashes were escorted home on August 5th by the Forsyth County Sheriff's Department and Old Richmond Fire Department. Fox 8 News was there to capture this hero's homecoming. A crowd of people lined the street to Officer Karen Simmons and her wife, Keely Greene's home.